The goal of Oheb Sholom’s religious school is to help each student develop into a thoughtful, mature Jewish adult. 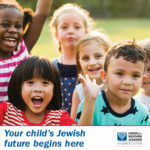 Our educational programs focus on Judaic, Hebrew, and applying Jewish values within our community and beyond. At our religious school, we seek to share the gift of our Jewish heritage and our Reform tradition. The religious school program provides classes for pre-K through seventh grade. Sunday school is held from 9:00 am – 12:00 pm, and children in grades 3 through 7 also attend religious school each Tuesday evening from 4:15 pm – 6:00 pm. Please contact our Religious School Administrator Judy Synnamon if you have any questions.